How Can I Write Without Understanding How Writing Works? So, we’ve established that writing is a skill that takes practice and there are nuances to writing that can be learned. When we read a good book, we see what works well and what doesn’t, or sometimes we don’t see what is working well, because it is working so well that we can’t really explain why that is. In fact, those are actually her hands playing! After listening to her for so long, I know when she has played well or when she has hit a wrong note. But 11 years of taking her to lessons doesn’t help me very much if I sit down at the piano myself. I have learned some things over the years from watching her, but I will never be able to just sit down and play like she does, unless I learn the parts first for myself. 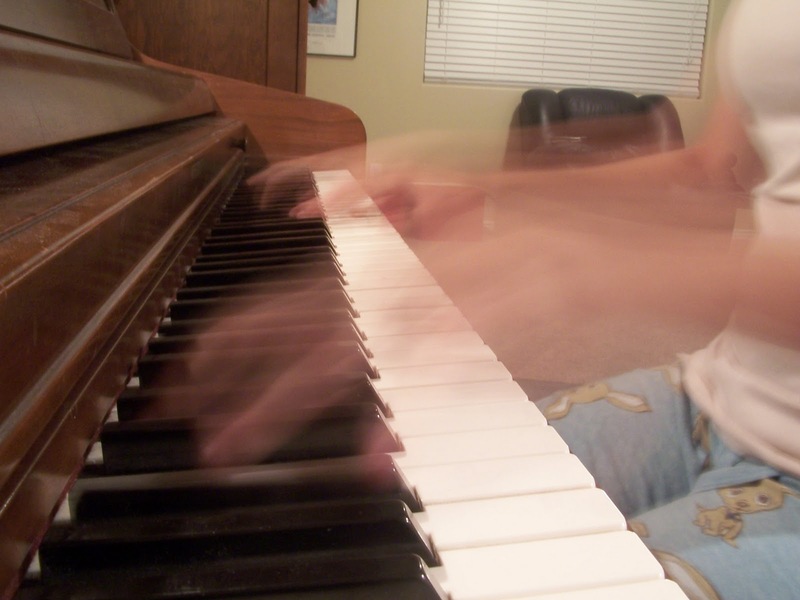 With piano, that seems easy- take lessons. With writing, it isn’t as simple. No one ever sees a flyer on a telephone pole for writing lessons (Hmmm…. wait, what was I saying?). In academia, back in the day (meaning when I was getting my BA… meaning before the internet if you are trying to figure out when that day was), we had to figure out how to master academic writing by reading good writing, deciphering minimal notes from professors, and figuring it out ourselves. It was kind of awful. These days, a lot of teachers and professors use a student-centered model, meaning trying to teach focusing on the students first instead of the material first (This seems a bit like a “duh” to me, but that’s how my mind works anyway). 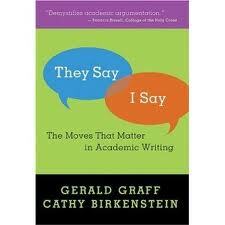 I use a book in my classes called They Say; I Say: The Moves that Matter in Academic Writing by Graff and Birkenstein. There are a few different iterations of this book with varying subtitles, but they all teach the same principles. The point is to demystify academic writing by breaking it down into its parts and explaining how those parts work together. There are plenty of lessons in this book that apply to creative writing as well. For instance, answering “so what?” When my students create an argument, I make them show me their thesis statement- their main argument in a nutshell. If they tell me something like, “America has an obesity problem,” I then say, “Okay. So what? We knew that already. Why is this important to you? What do you think should be done about it?” They then grunt, go back to their desks, and try to figure out the answers to those questions. (BTW, I sound much nicer when saying this in person than it comes across in writing). Another concept taught in the book is how to create good transitions. One sentence should connect to the ones before and after it. One paragraph should connect with the ones before and after it. Stream-of-consciousness does not work unless you happen to be Sherman Alexie. One unique strategy to the book is the use of templates. It provides dozens of them for writers to use. The purpose of the templates is for writers to use them as a way to freshen up their writing and also to have set “moves” that they know work in academic writing. An example is: “Conventional wisdom dictates ______.” While some may find this a stilted way of writing, I find that it helps students immensely, as their own ideas still have to go in the blank. Heck, they help me when I get stuck in a rut and just need a new way to say something. To sum up, I’m not only recommending this book to you, no matter what kind of writing you do, but I also want to remind you that there are other books, classes, blogs (ahem), workshops, etc., etc. that can help you learn the parts for yourself. And, again, as we all keep saying, it takes time to hone the craft. Hey, I have this book! Does that make me smart? I love the saying that learning how to write is like getting college degree again. It takes about that long to finally have the success aka publication. No. Your brain makes you smart. Hi Tasha, I was following your other blog, but now I'm following this one too. I love using the “so what” approach. Sometimes I use “what if” and “maybe” to get going, but then you kind of have to throw in that “so what?” as well. Great stuff here.I have to read it again! I love this post, especially the piano analogy. I think being an avid reader can help pave the way for becoming a writer, but the only way to make the journey (even with the pavement) is by actually writing. Also, I think everything works if you're Sherman Alexie. How is he so awesome? My college freshman daughter came home last night for help on an essay due Monday. She's a good writer, curious and introspective, and can convey her thoughts pretty well. But I see the importance of asking 'so what?”. I'm going to get that book! Thanks for the post. Awesome, Dawn. I'm glad I could help. Welcome, Jess! I just love this book, and my students do, too. A lot of them keep it, and that's saying a lot for freshmen who have to choose between eating a meal and keeping a book.